Anyways... with prepping meals for company, I've learned the best thing to do is find recipes that are simple in nature and include partially made ingredients to save on time and my sanity. The following menu is something that would be perfect for a small fall dinner gathering or even just a great family dinner on a chilly fall night. Major plus... 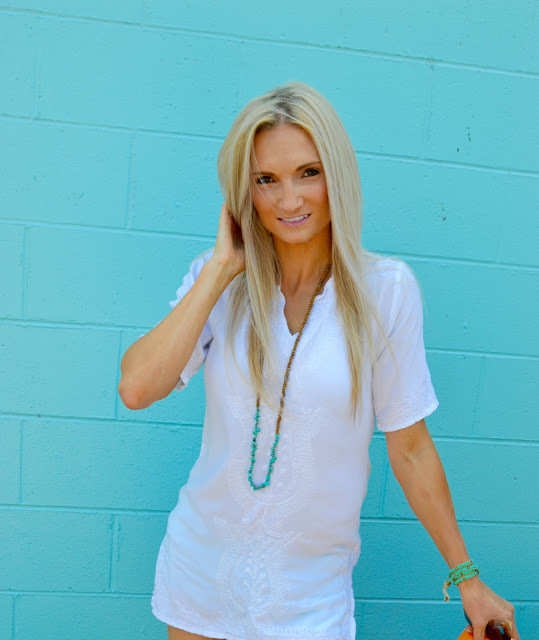 It took me a total of 15 minutes to pull it all together while my kids were also needing attention! 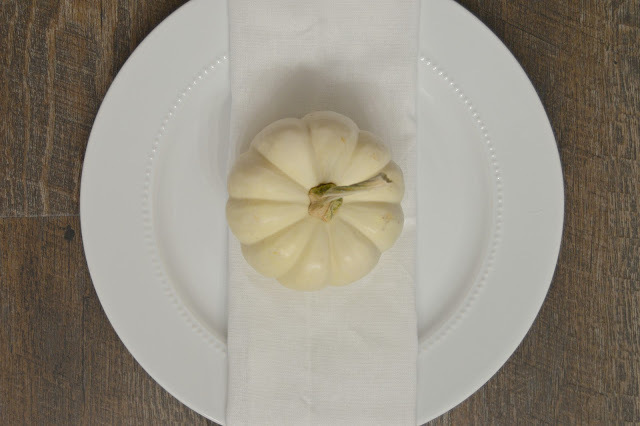 I kept it super super simple by folding a napkin over each plate with a small white pumpkin. If you are doing this for kids, you could have a fun painting station set up for after dinner. After they eat they can have fun painting their mini pumpkins while mom and dad talks with their friends! 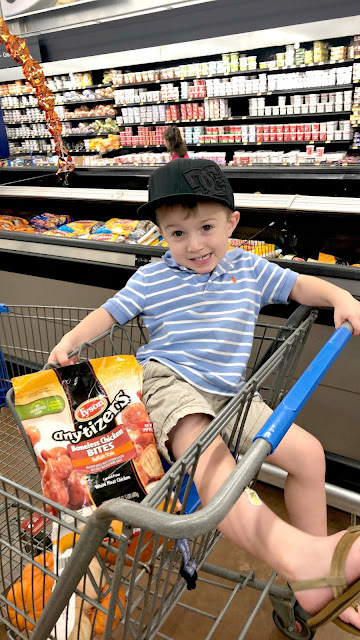 I knew I wanted the main course to be something I could quickly put together, so Tyson® Any’tizers® Popcorn Chicken was an easy go to choice. They are so versatile and go with any menu. After baking the Popcorn Chicken in the oven I simply tossed it with the Sweet Italian Sausage and favorite glaze. Pour everything into your favorite serving dish and viola! Main course done!! The salad is just as easy to get on the table. Grab your favorite salad bowl and toss the spinach, shredded Kale, and Brussel Sprouts. On a cutting board, roughly chop pecan halves and sprinkle over top of salad along with dried cranberries and cherry tomatoes. To finish, lightly crumble the goat cheese over the whole salad and set on the table with your favorite dressing. The homemade whole wheat bread was baked by my sister in law. She is amazing and bakes us a loaf every-time she makes one for her family. Nothing says fall to me like warm homemade baked goods. If you're interested in getting this recipe, comment below and I'll see if I can work on a post with her! Don't have an amazing sister in law on your hands? Not a problem! I also like swinging by my local baker and grabbing one of their fresh baked loaves from them as well. 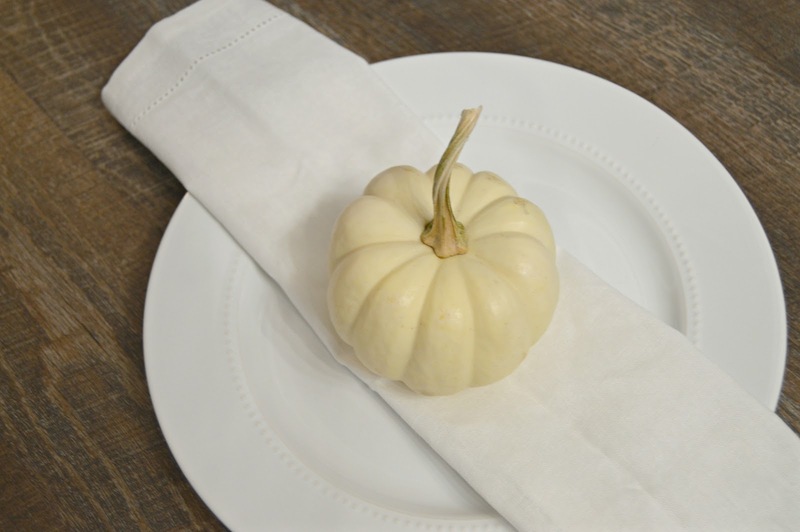 Or I mean you could always make it yourself but this particular post is all about easy fall hosting. What are your favorite go to hosting tricks? I'd love to hear how you make hosting simple and cozy these fall nights!